The specimens have been on display for over a century, and in that time some of them have begun to split and crack, their filling may be poking out or they are just plain dirty. They require expert museum conservators to repair them, ensuring that they will survive for the long-term future. That is the key aim of this project: Fluff It Up: Make Taxidermy Great Again. The specimens in need range in size from a chimpanzee to a pink fairy armadillo, and include platypuses, a koala, a turtle and a pangolin. Given the rarity of these species in the wild, as well as the historical value of the nineteenth and early twentieth century specimens themselves, they would be essentially impossible to replace. Taxidermy in museums plays an important role in engaging people with the natural world and the incredible biodiversity alive today, and is enjoying a period of renewed popularity. A number of the animals are going away for treatment by expert conservator Lucie Mascord for a few months and toy soft animals will take their places in the museum’s display cabinets. 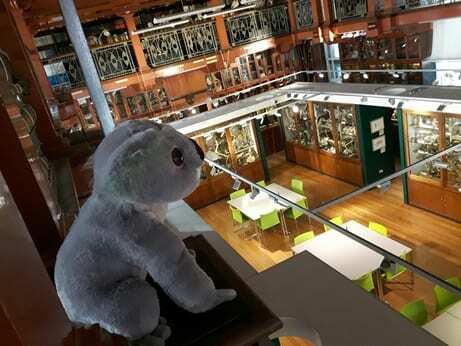 As well as that, large toy animals will be sitting on plinths around the museum’s balcony, where plaster busts of great medics once sat when the venue used to be a medical library before the Grant Museum moved in in 2011. We hope this will raise awareness of the skilled work taking place. This week (until Thursday) Lucie will also be doing as much of the treatment as possible in the gallery itself to allow visitors to see up close how such specimens are repaired. Taxidermy is the art of arranging real animal skin over a pre-made “form” of the animal’s shape in a lifelike pose (so they aren’t actually “stuffed”). It is impressive that these specimens last so long (the oldest in the Grant Museum could be over 250 years old), but it is of little surprise that some of them are now in need of expert care. Taxidermy is the mainstay of most natural history museums, however, because we are a university museum, originally founded in the 1820s to teach England’s first students of zoology, we don’t actually have a large taxidermy collection here. This is because historically, taxidermy specimens have not always been very accurate – loose animal skins would be sent from collectors around the globe, and then mounted when they arrived in the UK – sometimes by people who had never actually seen the whole creature. As such it wasn’t always considered reliable enough to be used in teaching. Nevertheless we do have around 75 incredible taxidermy specimens here, and they are the focus of Fluff It Up: Make Taxidermy Great Again. Among them is a chimpanzee from 1913 which has a huge crack running through his groin and several more across his face. There is a koala which is splitting to reveal the wood-shavings beneath the skin, and an inflated pufferfish which has lost its tail. However we have decided not to repair all the damage: our Australian echidna – a fascinating spiny relative of the duck-billed platypus – has feet which point in the wrong direction and rips across its ankles. 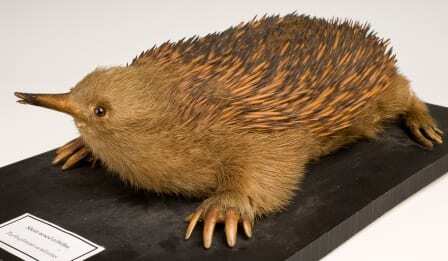 These rips were made when the taxidermist twisted the feet around to point forward – echidnas were so unfamiliar to people in London that they didn’t realise that their feet should point backwards. We won’t be correcting this mistake as it forms invaluable evidence of the ways these animals were historically understood. Instead the echidna will have a few broken spines repaired, as well as a good clean. Fluff It Up: Make Taxidermy Great Again is running until September, when the toy animals will be on display. 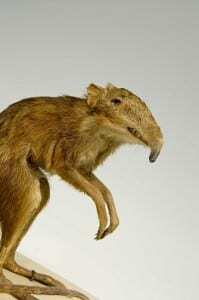 The Grant Museum of Zoology is open from 1–5pm Monday to Saturday. Admission is free and there is no need to book. Your Taxidermy collection is maybe not large but as I can see you have some incredible pieces of Art & History. I hope one day I can have a closer look.